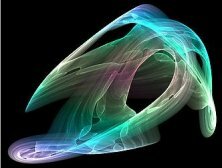 One of Chaos Theory's "strange attractors"
Is Climate Chaotic or Random? Many of the people involved in climate modelling were not actually trained as scientists but as applied mathematicians. To the lay person they may sound similar. In fact "mathematician" has rather more cache than "scientist". To an applied mathematician a model is assumed to be correct and to represent reality if a single observation is found which validates the model. Mathematicians are concerned with how the world ought to behave. To a scientist a model is assumed to be to be incorrect and to not represent reality if a single observation can be found which falsifies the model. Scientists are concerned with how the world really does behave. As a result applied mathematicians have a problem with statistics which they see as a waffly pseudo-discipline used by biologists. They deal solely with deterministic equations and remain forever trapped in the 19th century (see the Deterministic-Stochastic Dichotomy in the September 2010 pages). In place of the "stochastic process" of statistics, they use "deterministic chaos" and its "strange attractors" (above) to justify their long term predictions of climate. In effect they say "because weather is chaotic climate is predictable". This is rather like a racing tipster who cannot tell you the winner of the first race at Flemington next Saturday being quite confident about which horse will win the Melbourne Cup in a century's time. A pdf (40kB) of a paper going into this topic in detail can be found here. The paper was submitted to "Philosophy of Science". The rejection email may be found here.